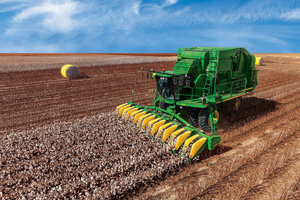 John Deere's cotton strippers and cotton pickers are among machines awarded for their harvesting technology. The American Society of Agricultural and Biological Engineers (ASABE) has announced that John Deere’s grain and cotton harvesting equipment has been recognized with an AE50 Award for 2018. The John Deere S700 Series Combine received the award for making innovations in smart technology, operator comfort, and data capabilities, which all lead to more efficient grain harvesting. "The S700 Combines integrate new technologies that optimize and automate grain harvesting, making it easier, faster and more efficient for the operator," said Matt Badding, John Deere marketing manager for harvesting equipment. "By automating more adjustment and calibration tasks, we've enhanced the operational intelligence of these machines while improving overall durability and productivity, based on each customer's crop and field conditions." The CP690 Cotton Picker and CS690 Cotton Stripper we awarded for their precision cotton-harvesting technologies, which include moisture sensing, round module weighing, and the John Deere Operations Center Field Analyzer. "This is the first time onboard moisture-sensing and round-module weighing technologies are factory integrated into a cotton harvester to provide real-time data that corresponds to cotton quality," Badding continued. "These features help cotton producers to preserve lint and seed quality while optimizing their overall production system to maximize yields and profits." More information on the S700 Combines, CP690 Cotton Picker and CS690 Cotton Stripper can be found by visiting www.Deere.com or by contacting a local John Deere dealer.